Yes, garage music is everywhere. Even in South America. While visiting my mom’s family a few years back in Lima, Peru. 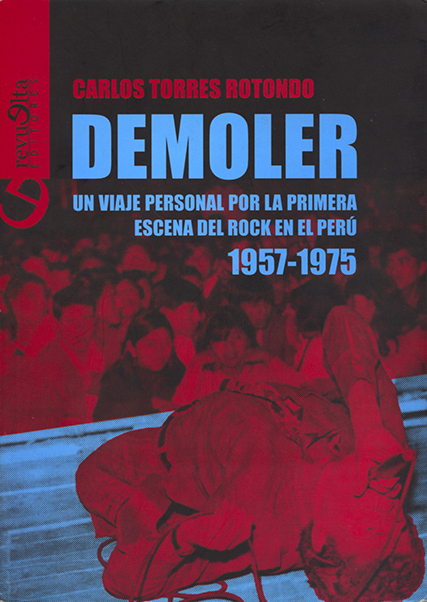 I made a point to pick up Demoler, a book by Peruvian Carlos Torres Rotundo on the history of the rock scene in Peru from ’57-’75. Although fluent in Spanish, I put it down shortly after buying it from just the sheer effort required to read it. A few weeks ago, after finishing Richard Hell’s bio of his punk years, I decided to start working my way through it again. Boy, did it pay off. The book gives a wonderfully colorful and detailed picture of the era. Here are some choice nuggets. 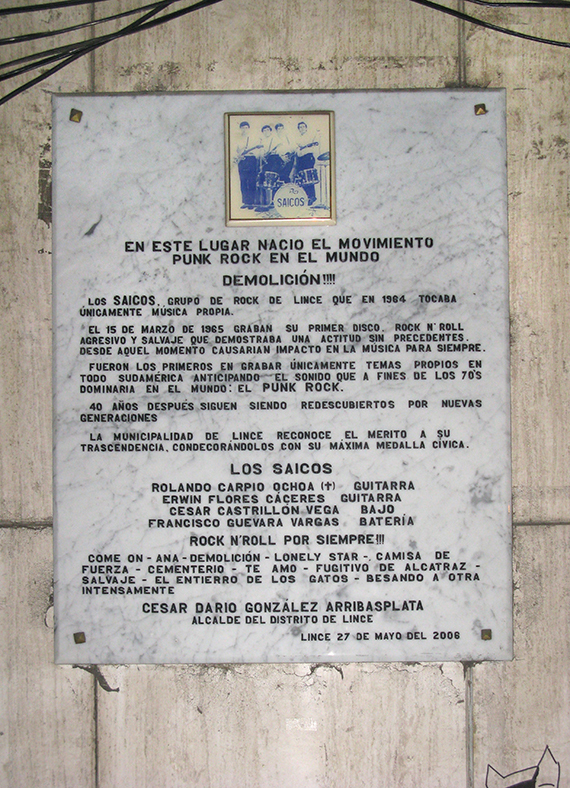 The section on Los Saicos explains how they recorded most of their genre-defining output with folkloric-recording engineers who decided it was best to just plug them straight into the tape machine directly, lest their howling amps fry their equipment. Or, how for their first performance, Los Saicos were invited to the illustrious Cacodispe music festival, only to perform “Come On” and have the capacity crowd respond in dead silence after they finished. After they started gaining some notoriety, the gigs started increasing at a furious pace. Using an old truck with Los Saicos hand painted on one of the doors, the band did five to ten performances every Sunday in local theaters. Every promoter wanted a piece of them. 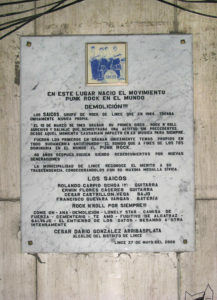 A plaque honoring Los Saicos in the Lince neighborhood of Peru. Another more tragic tale relates how the popular Golden Boys’ drummer, “Chacal” Allison became destitute and homeless in later years and survived only through the good graces of other former beat group members. Aware of his fragile existence, the older rockeros often gathered together and did benefits for their lost musical brother. Yet another anecdote described what happened when Los Shains first performed “El Monstruo” (aka The Crusher) to a matinee audience. As the singer growled “I’m a monster, I will destroy you…” a heckler yelled out “Hey fucker, blame your mom for that!” Which naturally led the singer and guitarist to promptly jump off the stage and pummel the offending audience member. The song was never performed live again—just in case any similar incidents were to occur. One thing that never fails to amaze me is how garage punk has transcended international borders. Both in the 60s and especially today. Especially considering the fact that many folk are still in the dark about the entire genre. Nevertheless, the underground nature of the movement hasn’t stopped scattered scenes from all around the world from creating their own localized versions. One of those places is Japan. Amazingly, the Japanese garage music scene continues to flourish amidst a sea of homogenized pop bands. Much of the reason for that longevity comes down to the dedication of a handful of true believers and visionaries such as promoter Daddy-O Nov.
For a quick sample, please enjoy the trailer below for Garage Rockin’ Craze. An amazing, long overdue documentary on the current Japanese garage rock scene by Japan-based filmmaker Mario Cuzic.